Devastated families of students killed in Wednesday’s deadly classroom bombing on Thursday laid their loved ones to rest. This came as the country reeled in shock over the suicide bombing that claimed dozens of young lives. The victims were mostly students aged between 16 and 19 – both males and females. Some eyewitnesses said there were probably about 100 students in the class at the time of the explosion. They had been taking extra lessons in preparation for the university entrance examination. Health officials on Wednesday night confirmed at least 48 people had been killed in the explosion. Eyewitnesses said however the death toll was more likely around 60. On Thursday morning, hundreds of people gathered at cemeteries in Kabul to bury their loved ones. In Darulaman, heart-wrenching scenes unfolded – and a group of young girls were seen carrying the coffin of one of Wednesday’s female victims. Grieving relatives also huddled around coffins. This suicide bombing came amid a week of heavy violence in the country – violence that everyone in the country hopes will subside. 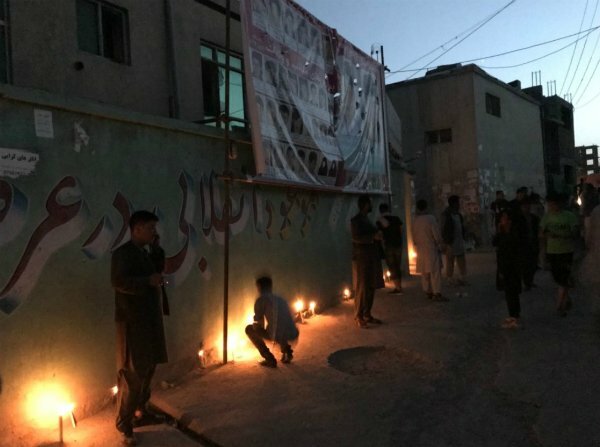 Hundreds of people, including security force members, have been killed in attacks since Friday – many of whom died in the four day siege this past weekend of Ghazni city. But Wednesday’s bombing sparked a world-wide outcry with governments, organizations and members of the international community decrying the attack. The US State Department said it strongly condemned the attack and was “appalled” by the suicide bombing at the education center in Kabul. “The US continues to stand with the government and people of Afghanistan and will continue to support their efforts to achieve peace and security in their country,” the state department’s spokesperson said. 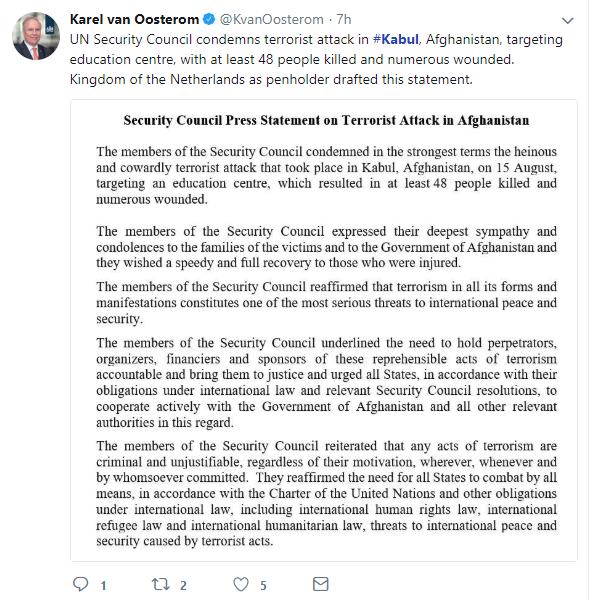 According to Henrietta Fore, UNICEF Executive Director: “Today's direct attack on an English language class in Kabul, which killed or critically injured dozens of children aged between the ages of 16 and 18, is deplorable. “This violence must stop. UNICEF continues to call on all parties to the conflict to adhere to and respect humanitarian principles, and ensure the safety and protection of all children. Children are not, and must never be the target of violence,” Fore said. UN Security Council also issued a statement condemning the attack. President Ashraf Ghani was also quick to condemn the incident and slammed it as a “terrorist attack”. “The brutal terrorists by targeting educational and cultural centers show that they are totally against the principles of Islam and the prophet,” Ghani was quoted as saying. Meanwhile on Wednesday night, a group of young men held a candle-light vigil for victims outside the academy. Thousands of messages of condolences have also been posted to social media, from people around the world. 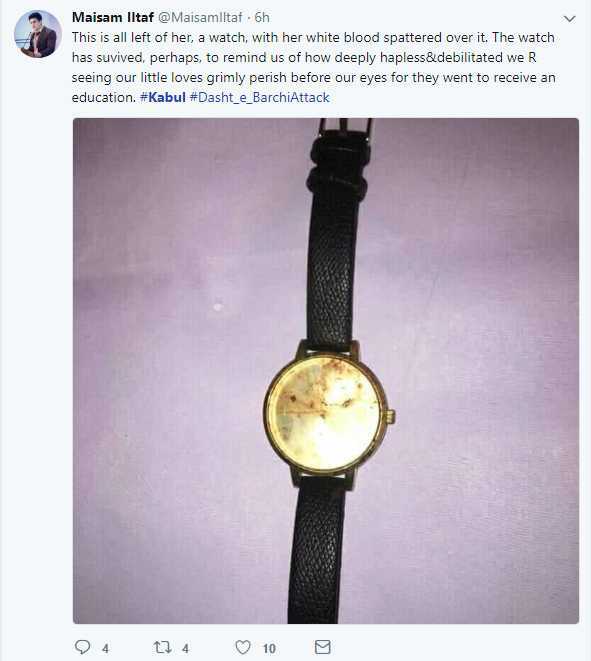 One heartfelt message from a relative of a female victim carried a photograph of the victim’s watch and said this was all that remained of her. Governments and people in Afghanistan and around the world have voiced their shock and horror over Wednesday’s suicide bombing.